This is understandable if someone has not sung in the company of others for a long time. I try always to point out that everyone else probably feels the same and that nobody will be put on the spot or asked to sing solo. The beauty of large groups singing together is that people can ‘hide’ in the big sound and only come more forward when they are ready. The word ‘choir’ does conjure up images of endless school assemblies or long church services or rows of posh people dressed up and standing stiffly singing music that we can’t really relate to. However, there are many, many different kinds of ‘choir’ out there and there will be one to suit every taste. Some choirs indeed require certain musical knowledge, but there are countless choirs and open-access singing workshops that don’t assume any kind of musical knowledge or previous singing experience. We teach songs by ear. Yes it’s true: many established choirs tend to consist mainly of people over 40. This can put off younger singers. However, from my experience, I’ve worked with groups whose ages range from 18 to 80 and it’s simply not an issue as everyone is connected by their common love of singing. When joining an established choir it will almost certainly already have a repertoire of songs. Even if someone does know a song already, they certainly won’t know the particular harmony arrangement. In fact, it’s often harder to learn an arrangement of a song if you know the melody already. In our choir, new members are gently led into the old repertoire, and every new season starts with songs that are brand new to everyone, so there’s no chance of you getting left behind! This mainly comes from blokes I have to say. I guess many men put their jobs before their own pleasure and leisure. It’s strange how we have many women in choirs who have high-powered jobs and families, yet they manage to find the time to come and sing. Really, is it that much of a time commitment, especially for those who say they love to sing? Two hours a week. Surely you can find time in your busy schedule to do something you love? It may seem to be old-fashioned, but that doesn’t detract from the fun and enjoyment that can be had. Dancing is old-fashioned too and has been around for millennia! Most people know singing together from church or by seeing classical concerts, yet there are many, many choirs and singing groups throughout the country who don’t sing religious or classical music. Their choir sessions are fun and vibrant, nothing old-fashioned or dated about them. Well you do now! Just come along to the Town Hall in Louth at 7:30 on a Tuesday evening. 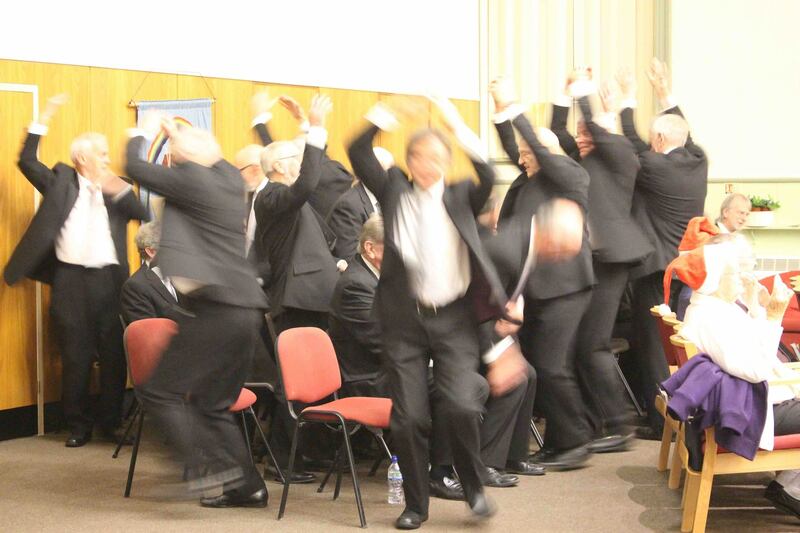 Some say that Louth Male Voice Choir is the best club in Louth. Me too! Many people don’t like being in that strange state where they don’t quite know what they are doing and are a bit lost. It’s not a nice feeling. But you have to be patient and allow plenty of time to get a tune and the words under your belt. It’s about trusting the process and making mistakes as you become more familiar with a song. Many people think they can’t ‘sing’ because they imagine that ‘proper’ singers only need to hear a song once before they know it perfectly. They don’t realise that even professional singers can take several months to really learn a song and make it their own. Like most things, learning songs gets easier with practice. Aha, this old chestnut! A common complaint heard from many people who are very happy to sing around the house for their own pleasure, but would hate to ‘inflict’ their horrible voice on other people. Of course everyone can sing. Not necessarily in the same way or to the same standard, but they can sing nevertheless.